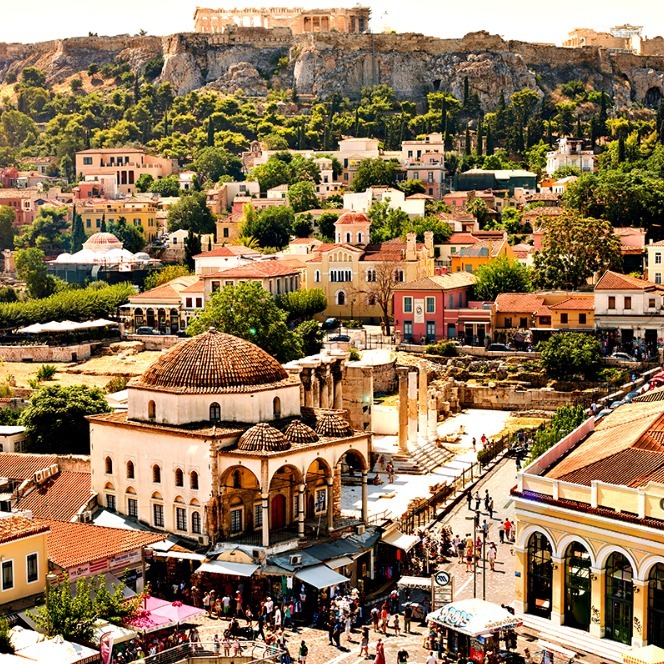 Even though Athens is a year-round destination with a myriad of things to see and experience, if you happen to be in the city in the summer, the opportunities are especially endless. Our favourite option? Do as the locals do and spend warm, summer nights going out for a meal or drink… from above! What’s better than enjoying an ice-cold beverage while taking in a million-dollar view? Best of all, food and drinks in the city are among the cheapest in Europe, and the view is free if you visit a rooftop restaurant or bar downtown. 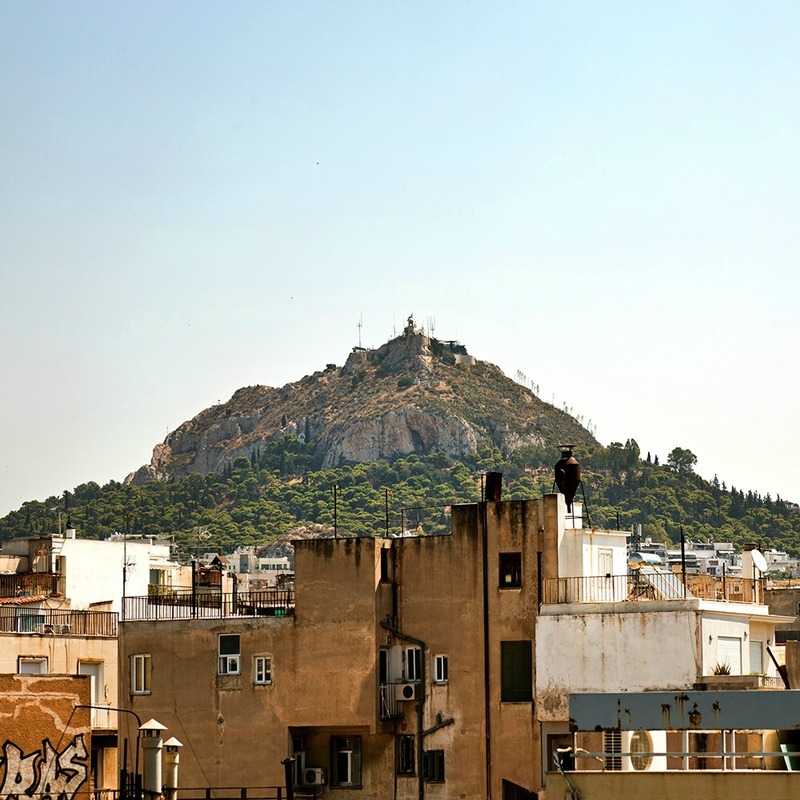 Check out our list of the best rooftops in Athens — our personal favourite has a breathtaking view of the Acropolis! Loukoumi is a coffee bar with an edge. Located in Monastiraki, the retro lamps at this place are shaped like the planets. Aside from feeling like you’ve been thrown into outer space, the real discovery is the sensational view of the Parthenon and the Observatory when you sit on the balcony. In the evenings, there are events with live music, and theatrical performances are also organised. It’s not unusual while sipping your coffee to find yourself in the middle of rehearsals! During the day you can drink coffee, browse through a periodic photographic exhibition, play chess on an extra large chessboard, or accompany your raki with Greek appetisers such as ntakakia, syglino, apaki, and even get some mussels at affordable prices. If you check in early, you’ll very likely be able to watch a theatrical play live, or catch a DJ spinning some good music before the crowds come. Address: Pl. Avissinias 3, 105 55, Athens, Greece. 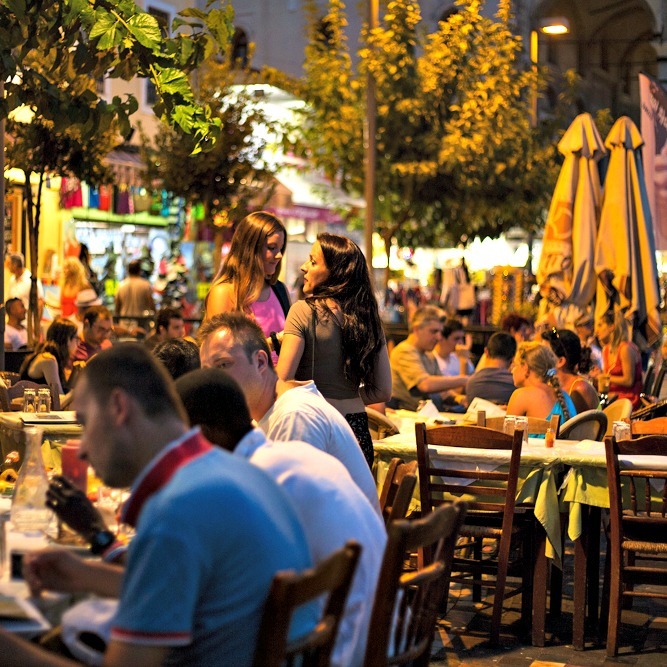 In the historic heart of the city you’ll find a “kitchen” or kuzina in Greek. Kuzina has a wonderful view of the Temple of Hephaestus and the Sacred Rock of the Acropolis. Chef Aris Tsanaklidis blends traditional Greek flavours with Mediterranean and international ideas. The chef, however, isn’t the only reason to visit this venue — Kuzina hosts one of the best rooftop bars in Athens, called a tarazza. Enjoy a mouthwatering menu or have a drink at sunset — we guarantee you’ll visit more than once! Address: Adrianou 9, 105 55, Athens, Greece. If you’re looking for an experience that’s a little more fancy, the Galaxy Hilton doesn’t disappoint. Ranked as one of the “World’s 10 Best Rooftop Bars” by Premier Traveler in February 2015, you’ll experience a stunning view of the ancient Acropolis and have the opportunity to mingle with Athens’ stylish elite. The rooftop Galaxy Restaurant & Bar is located in the Hilton Athens Hotel, is ultra chic, and is as luxurious as luxurious can be! A celebrity favourite, the five-star dining experience will blow your mind, and the availability of unique cocktails guarantees that this is the place to be. Address: Leof. Vasilissis Sofias 46, 115 28, Athens, Greece. Located a few minutes from the Monastiraki metro station, A for Athens serves the best views in town. Open from 11am to late at night, this rooftop will quickly become your go-to meeting spot. The modern vibe combined with the historic location helps draw in large crowds. Don’t be surprised to see a long queue outside the elevator that leads you from the ground floor to the sixth floor — this is a daily occurrence! You won’t even remember the queue you were standing in once you exit the elevator — the view is worth every second of the wait. A unique, live-frame of Athens that focuses on the Acropolis, Monastiraki Square, the Observatory, Metaxourgeio, and Lycabettus can be seen — something you won’t find anywhere else. 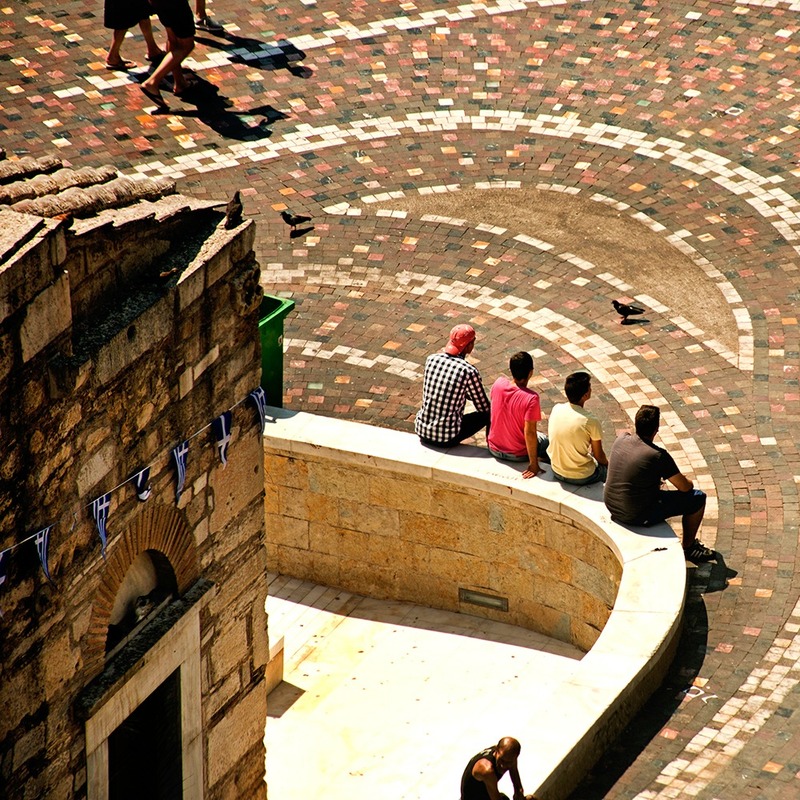 Do as the locals do on a hot, summer day: people-watch! The service is fast, the employees are polite, and the drinks… well, the drinks are more than excellent. Our favourite is the “A for Athens Sour,” a drink that won the head bartender, Theodore Pyrillos, first place at the European Cocktail Competition. Made with liqueur mastic, rosewater, homemade grenadine, and fresh lemon juice, this drink will quickly become your best friend! Address: Miaouli 2, 105 54, Athens, Greece. The perfect spot for watching a sunset — or sunrise! With 70 inspiring cocktails to choose from, and a unique view of ancient Athens, this industrially designed rooftop overlooking Monastiraki Square has views unlike anything you’ve seen before. Good music is always a part of an evening at this classy establishment, with swing, jazz, and funk options available on the regular. With creative Greek cuisine by Chef George Patsopoulos, 360 Monastiraki is an oasis in the heart of the city. Address: Monastiraki Square and Hephaestus Street 2, Athens, Greece. This great hotel has a pool, bar, and fantastic rooftop restaurant that overlooks the city. Tempt yourself with a delicious dinner or relax in the roof garden and enjoy a drink or two. The most interesting part of the view is outside the rooftop bar and swimming pool, with a view of the Acropolis and the beautiful Greek sunsets. Located in a leafy suburb of the city near the Pedion of Areos Park (another suburb close to the city centre), this rooftop is easily accessible by public transportation (the Victoria metro station is only 300 metres away from the hotel). Address: 10 Alexandras Avenue, 106 82, Athens, Greece.